And so—I ran into another digital issue that irked me. I was using the Canon 20D and I always had trouble with burnt-out highlights. I was always looking at the histogram to see if I had lost any data with a spike at the right side. So eventually you find yourself shooting 1/3 or 2/3rds of a stop under, just to be on the safe side—though what you really want is to approach the edge of the histogram cliff without falling over. And the thought hit me like a eureka moment: why not have an exposure mode on cameras that simply puts all the highlight information just to the left of the right-hand side on the histogram? I can think of a lot of technical reasons why this might be difficult, as I'm sure you can. Mainly that the histogram is an analysis function (post-exposure) and and exposure is a metering function (pre-exposure), and, second, that the mirror gets in the way of integrating the two. Fine, but camera engineers are remarkably clever folks, and they could get there if they tried. It's what we need, anyway. ...Which gives you a quick, positive, visual read (wherever a bright area remains) on where in the picture you allowed your highlights to blow out when you took the pictures. Meaning, for me, that if any of these areas are prominent or important (the cheeks and left forearm of the kid in front in this shot), these are going to be the touchy areas you're going to be struggling with during all the rest of the processing procedure, because those are the areas where you don't have enough information in the file. The ideal, of course, is not to have any blown highlights at all—in Dave's words, "what you really want is to approach the edge of the histogram cliff without falling over." It would be cool if the camera could be set to do that natively. Mike replies: Well, you learn something new every day. Although I did figure out why I've never used this particular trick...when I hit the option key on my (non-Apple, non-standard) keyboard, it brings up a nice, bright display of which apps I have open at the moment. You know what they say: Oh well. When I tried it with the other option key, however, it worked. Thanks Carl. Featured Comment by dcs: I don't know about you, but I'd rather have a sensor with enough dynamic range that I wouldn't have to worry about clipping the highlights and exposing to the right. Having an exposure mode that keeps the histogram just to the left of clipping seems like a hack to get around the limitations in current sensor design. I imagine we'll see better sensors before any kind of exposure mode like that. I guess, that one reason is (at least for DSLRs) that the histogram is not computed in record mode. It's only computed while playing back the image. I found another reason when I played around with my little Sony camera a couple of years ago. Surprisingly or not, the record mode histogram is not as accurate as one might think. I found that the histogram that was carefully calculated after the shot (by, let's say Photoshop) looks substantially different than the one you'll be shown in real time when capturing the image. However, that's some time ago. Maybe the camera CPUs are strong enough today to perform the task accurately in real time. More than a few people have suggested a simple aperture-priority exposure process where the shutter is closed when any of the sensor elements is about to max out. The focal plane shutter is an obvious complication. Another is that it would require more transistors per sensor element. Others might have use for such a thing, but for myself, I'd rather be in charge of exposure. 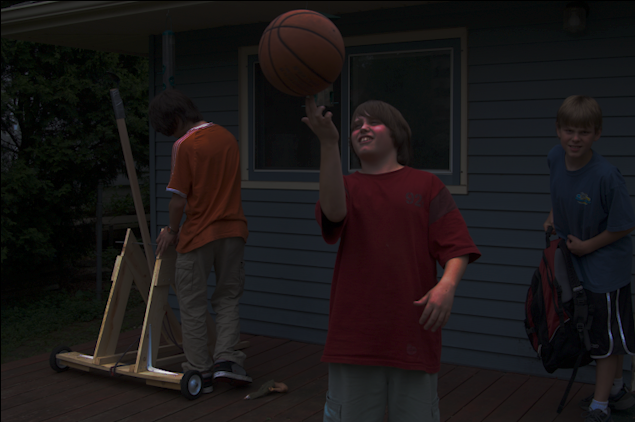 If there is only one bright spot - won't the whole scene be underexposed due to the dynamic range of the camera? It sounds nice at first, but I can't imagine that such a mode would be useful. The metering modes on most cameras are good for almost any situation if you learn to use them well. Learning how to expose correctly with the zone system using a digital camera might be more useful. Any competent photographer can expose any scene perfectly with any camera given enough time. The only reason for automation of any sort is that in the heat of shooting you don't have time, or aren't careful enough. Show me a digital photographer who's never blown his highlights and I'll show you a liar (if that's not putting it too harshly...). Most dslr cameras have this capability already, sorta. Just set the metering to spot, measure the brightest thing in the picture, and overexpose it 2 or 2.3 stops. This is the most exposure you can give without burning anything out, and will show a final histogram at, but not over, the edge of the cliff. Works fine when the bright areas are large, but would be difficult or impossible to do with your example picture. It's also slow and cumbersome. Given the number of segments "matrix" metering uses,it might be easy to have a mode where exposure is set to "Place" the brightest segment on "Zone VII+1/2" and do it just as quickly as it does far more complex calculations. Why not? I believe that control of the exposure is always going to fall back on the photographer in at least some situations. No matter how wide the dynamic range of the sensor, there will be times when the dynamic range of the scene exceeds the dynamic range of the sensor. (Replace "sensor" with "film", and this would have been old news a centry ago.) However, having a camera that provided an accurate pre-exposure histogram would give the photographer more information with which to make an informed decision. Today the Olympus E-330 and the Panasonic Lumix DMC-L1 both have a live preview mode that takes the data from the actual imaging sensor and display it on the LCD. (This is in addition to the "almost live" mode which uses a separate imager in the prism.) It seems that the calculation of a live historgram would be a very welcome addition to these two cameras, assuming that he processing power is there. This is exactly why I still keep an incident light meter in my left hand, the meter in my camera on dumb old fashioned center weight, and the mode on manual. It always worked for slides, and it still works for digital. Even so, when I have time, I take a shot, check the histo and adjust on the fly, especially when shooting stage performances. But then again, I shoot all of my personal street photography work on a camera that doesn't even have a meter, or a chip! 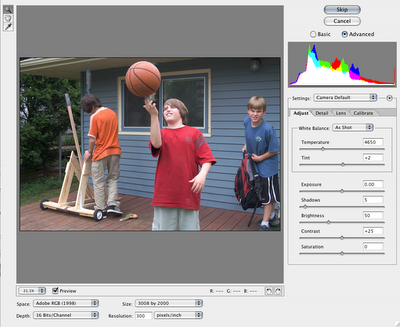 Going back to an earlier post, the Sony R1 features live on screen histograms. It makes it almost impossible to blow your highlights and makes keeping your exposure balanced to the right very simple. 1) A true three-channel histogram even on less-than-professional bodies (the 20D histogram is luminance-based, so it is easy to blow one channel and not know it). 2) A sensor that exhibits the classic 'heel and toe' rolloff in the highlights and shadows, like many popular film types. Even though detail is compressed in those areas, with that kind of response, you can tolerate a wider dynamic range in the scene without completely 'losing it'. Why not have a multi-spot metering system that allowed you to tell the camera which parts of the image were highlights and which parts were shadows... Oh, wait, they put that into the OM-4 back in the early eighties..
"they put that into the OM-4 back in the early eighties." One of the all-time great cameras. I had three. I just wanted to explicitly restate what Mike said in response to the featured comment: on the PC, you use Alt when sliding the exposure slider in Camera RAW. Burned out areas will show up white. You can also do the same thing with the shadow slider. Working with images through the histogram to optimize exposure is actually quite common in scientific imaging. The ability to capture images in "live" mode while optimizing the histogram to the desired values to as to retain *all* of the image information is not only desirable, but necessary. It's a feature I've long wanted for digital SLRs. The technical side should be easy to get over, as most modern meters are already small digicams of their own. Like Nikon's 1005 pixel Matrix meter. Actuallly, Nikon had PC software for the F5 (I think) where you could hook up the camera to your computer and view a live preview of the Matrix meter. Put that info in the viewfinder as a histogram, or even as an overlay over your image when pushing the 'func' button (like a HUD display) to see exactly which areas are over- or underexposed. To me, it seems like the technology is already there in the camera, the techs and designers just need to make it available to the user in other ways than just giving us the usual exposure estimates. Panasonic has a very good tool for detecting blown highlights. The overexposed part of the scene blinks in black and white. This feature is present in their L1 DSLR and many of their point and shoot cameras. It only works in review after the photo has been taken. So you have to take another photo to correct the problem. If this could work before taking the image, like on a half press of the shutter, I think it would be much better than a histogram. Another improvement would be the ability to adjust the sensitivity of this feature. There hasn’t been much development in the viewfinder display in the last year. Canon shooters are still waiting for vital information to be displayed here such as metering mode and flash confirmation. This is something that Nikon photographers have had since the inception of electronic displays in the viewfinder. In the future, probably several years out, I would like to see manufacturers place an image evaluation chip in the light path to the pentaprism that evaluates the exposure and generates a histogram of the image. This histogram would then optionally be projected over the image in the viewfinder, thereby eliminating the need for traditional light meters since the histogram could be adjusted real time via aperture, shutter speed, or ISO. The results then could be seen on the projected histogram at eye point. This would eliminate all exposure guesswork and the need for test shots. Interesting concept, and what with Oly's dSLR which has live preview on the screen, it should be a relatively simple proposition! The arguments against doing this 'live' as part of the pre-exposure metering process are compelling. However, what if it were made part of the bracketing process. E.g. a double shot where the camera automatically shot, analyzed, adjusted, re-shot in rapid succession? Hey, I found this online video tutorial on how to read the photographic histogram, I hope that it can add to this article, and can help you as much as it did for me!